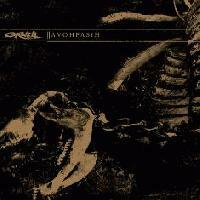 Orwell is a progressive death metal band with melancholic, as well as melodic, tendencies; hailing from La Crosse, Wisconsin. Since their formation in 2004 they’ve released two ep’s and two lp’s. Avohfasih, being their most recent ep release in 2011 shows a very matured Orwell utilizing all their past writing experiences while taking advantage of a more subtle smooth approach. Avohfasih is more of a smooth death metal style rather than an aggressive one. Yes, they can be quite heavy and intense at times but their music here focuses on transitions that are flush and sometimes peaceful and serene like the slow building tremolo techniques in the opening “From Depths I Rise”. In fact, this same track bestows beauteous female vocals during the rising passage, leading into a savory melodic lead line from guitarist Erik; not to mention, the track even drops back down once again after the rise showcasing the ep’s production style which has full audible bass throughout from William Stickland. Unlike many melodic progressive bands whose albums demonstrate a monotonous feel of repetitive riffing styles, Orwell draws influences from several different styles and sparingly saves melodic-harmonizing sections for moments that truly warrant them. A good example is the opening to “In Dust I Stand” where the tracks starts off with a trance-like, simple, alternating note that serves as a backdrop to harmonizing intervals that slowly creep their way into the formula. After a steady build, we are introduced into a well-fitting barrage of alternating melancholic-melodic precepts. Orwell doesn’t aim to be flashy or even try to create music that is beyond what’s been done before. They mainly just focus on writing solid music even if it may feel rehashed at times. When listening to Avohfasih you may at times say I’ve heard that before but in reality if that passage fits perfectly why use anything else" Orwell’s well thought out use of contrasting extremes of mellow clean sections compared to the distorted filled atmospheres is what gives them their unique feel. Although these high to low transitions are quite common in the progressive metal field, there is still something that just feels pure about what they’re doing which is hard to describe unless you’re actually listening to the album. The vocals here are quite interesting for this field of musicality because usually bands will favor a deep-guttural low toned vocal style but Orwell’s Logan Hauser is more often viewed as a harcore/metalcore type of vocalist which is where those tags may have sprung up. His mid-range approach, although different than the norm, still fits the music very well. I can’t think of any instance where I felt deterred. In the opening track, “In Tides I wake”, Logan really pushes the extended guitar-chord structures very well before a tasty tremolo/alternate-picked solo ramps in. So if anyone is deterred by that tag be assured it only occurs in the vocals, not the music. And you may be surprised to find out how well that vocal style can be represented in the vein of progressive death metal. Although an ep, Avohfasih is quite a lengthy release clocking in at 43 minutes. Whenever an ep feels like an ‘lp’ it’s reassuring to know how much effort and time artist put into their work and Orwell has done a great job here. If they continue down this path their upcoming lp will be a fantastic release worthy of their past fans attention. nice to see you reviewing again, pos'd. This does sound really cool, but alas, I'm not sure I'll have the time to check this out :/. I do want to compliment you on a well written review, though, so have a well-deserved pos. sup dude, i was just about to leave. Sounds cool, I'll check it. Will read the review later but I'm sure it's great so I'll pos now. Good review Captain, this sounds interesting. I'll give it a listen later since it's on spotify. Sweet review, Captain. Will definitely check this out. hey thanks buddy, I appreciate it! bummer, you must be a pretty busy person. If I'm not mistaken I believe you're in college too. Anyways, regardless, I'm sure you're taking care of priorities so kudos to you. Yeah, living on my own already, the time for music listening has declined a lot during this last year (gotta take care of my woman and uni first). Regardless, this sounds really cool so I will acquire it just because of you. I do sure hope so haha. And whoa, I had no idea you're a married captain. That's big news for me. If I may ask, for how long already? Haha, judging by the tone you communicate with here I would've guessed you were in your very early 20s the most. And nah man, I'm too young to get married or even think about it yet (even though me and my girl have been together for over 4 years already). I'll only be turning 20 in May. Thanks for the infos, bro. Best wishes, though, and that's cool to hear that you're a serious dude who sticks with his lady as most guys nowadays go through women like hot cakes; I know I did at one point when I was younger so I'm definitely not pointing fingers haha. Ahahaha, yeah, I never had that phase. In actuality, I've only ever dated one other girl besides the one I'm with. I don't feel like I'm missing out though - I'm absolutely loving my situation. Thanks for the good wishes and right back at you regarding them.